I was recently invited to host a robotics table at the Technology Share Fair: Gadgets and Gizmos for the 21st Century Classroom. In planning for the event I realized that the guiding principle behind both my students and my own education was Learn it With Them. At the start of the year I was very up-front about my ignorance: “We will both be learning how to use this.” Prior to a classroom experience, I didn’t know how to take a proper photograph, program a robot, create a video game, design using Sketch-Up, or key out the colour green on adobe premiere. Everyone single one of those skills I had to teach the students this year. Some of my classes are very much student directed, others more structured, but still project-based. This learning is genuine and we all participate in it; I can’t imagine any other profession that would provide such a rewarding experience. My primary source of tools, ideas and information comes from my RSS feed. Free tech 4 teachers, Billings Beta, George Siemens, and many many others offer unique approaches and fresh ideas. I try to read every morning. The second most valuable source of learning and inspiration for me as an educator comes from a network of teachers that are implementing the use of Google Apps at our school. We meet a little less than once a month, but there is always something valuable at these sessions. Other sources of professional growth are technology conferences and occasionally Twitter. I am only now able to start to giving back. 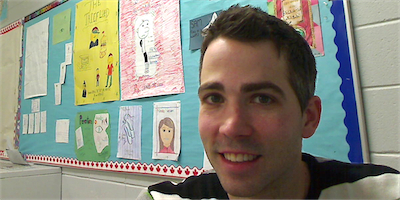 I have started blogging, and traveling to other schools that are interested in learning about technology integration. The giving back is just as valuable for my learning at this stage in my professional growth as the receipt of information, reflection always helps me redefine my belief and approach as an educator. And OH YEAH Delicious – Teachers need a way to organize their online life and effective bookmarking is essential to this. I am lost without it. Take a day with a techie. There is a reason they are so passionate about the value of digital tools. Ask a techie to help you create an RSS feed and add Byrnes, Ferlazzo, Coach Brown, or whoever – Explore. Set-up a Twitter account and learn about the #edtech hashtag, add Oprah or Obama or whoever – Explore. Ask the techie to help you create a classroom blog and share that address with parents. Look at TED talks, Look at Kahn Academy, Look at YouTube tutorials. Get set-up with a Bookmarking tool. With such a vast array of information and methods to access it, the best approach is to sample everything and then pursue what is most valuable. Take a few weeks to explore and pursue the path that suits you as an individual learner. The ability to create visual information! Creating text-only knowledge and understanding is almost irrelevant. Infographics, multimedia projects, digital stories. The essay is less and less relevant to the modern world and I think there is far too much focus on this archaic method of knowledge transmission. Students need to be taught that their future, even if not their career, will be enhanced by technology. There will be a new set of ethical and moral questions that they will have to answer in the realm of biotech, nanotech, and robotics, so that even those that do not participate economically in technology need to be equipped to answer big questions about technology. Students need to learn that learning is wonderful. If technology is the most effective entry-point into this understanding, then that should be encouraged and explored.